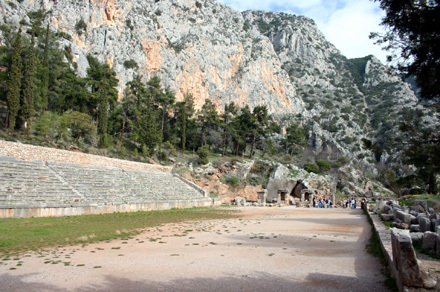 The stadium at Delphi is located above the Temple of Apollo and above the Theater. It was constructed in the third century B.C. and given its present form in the second century A.D. The many of the athletic contests associated with the Pythian games took place here although equestrian events took place further down the slopes. The stadium is 176 yards [161 m.] long and could seat 6,500.